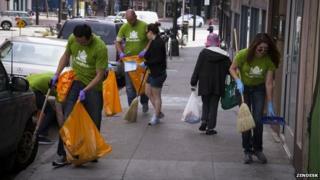 The morning after technology company Zendesk raised $98m (£56m) in a share sale in May, its boss led all 360 staff at its San Francisco headquarters out on to the local streets to pick up litter. The roads in question are located in one of the city's roughest and most deprived areas - the Tenderloin neighbourhood. Located in downtown San Francisco, Tenderloin has long had many of the city's highest crime rates, with violent street offences and drug dealing being particular problems. The name Tenderloin started to appear on maps of San Francisco in the 1930s. While there are numerous theories as to how it got its name, one of the most widely believed is the suggestion that policemen in the early 20th Century had to be paid more to patrol there, thereby enabling them to afford more expensive cuts of meat when they went to a steakhouse. Fast forward to 2014 and Tenderloin is not the type of place you would expect to see a successful high-tech firm like Zendesk base itself. Yet led by its Danish chief executive Mikkel Svane, Zendesk is enthusiastically leading efforts to help improve the area and the lives of its 25,000 residents. "I don't want to make us sound more idealistic than necessary," says Mr Svane, 43. "It's just important to be part of the neighbourhood and community." Founded in Denmark in 2007 by Mr Svane and two colleagues, Zendesk makes customer service software. Now worth $1.3bn, its clients include household names such as Disney, L'Oreal, Vodafone, Ikea and 20th Century Fox. The business relocated its main base from Copenhagen to California in 2009 to be closer to Silicon Valley venture capitalists and other start-up technology firms with global ambitions. Zendesk first moved into Tenderloin in 2011, where it recently opened a swanky new 73,000sq ft (6,800sq m) headquarters. The first technology business to base itself in the neighbourhood with the lowest commercial occupancy rates in the city, Zendesk did so after being given a financial incentive by the City and County of San Francisco. The local authority had long been keen to attract such growing technology firms to Tenderloin, to help boost the area's economy and aid its wider regeneration. And so the City and County of San Francisco introduced community benefit agreements (CBAs) for Tenderloin. Under the terms of Zendesk's CBA it got a six-year tax break on staff wages in return for pledging to carry out a certain level of community outreach work. Image caption Zendesk's mascot is called "the mentor"
So in addition to picking up litter, Zendesk staff do everything from helping to serve meals to the homeless, and teaching local people computer skills. Zendesk also donates money to local charities, and has space on its ground floor that people in the local community can hire out for free. While cynics may say that the company is only doing such things because it has to under the terms of its CBA, both the local government and community leaders in Tenderloin agree that, led by Mr Svane, Zendesk continues to do far more than is required. The amiable and outgoing Mr Svane certainly appears to relish taking a lead with the community work, be it the litter picking, giving public talks, or joining his staff in giving Tenderloin residents computer lessons. "It's interesting to see our continued investment in the neighbourhood and be a part of the future of the Tenderloin," he says. "It's something that we all enjoy very much." Other technology firms such as Twitter, Spotify and Microsoft have since followed Zendesk into Tenderloin under similar CBA deals, but local historian Deleano Seymour, 67, says Mr Svane and his staff lead the way when it comes to the level of community work they undertake. "There is no-one even close to doing the civic work that Zendesk is doing," he says. "Zendesk goes way beyond the requirement of the payback on the CBAs tech companies have with the city." So far this year Zendesk says employees at its headquarters have logged 1,676 hours of volunteer time in Tenderloin. Bevan Duffy, who helps lead the City and County of San Francisco's efforts to reduce homelessness, agrees that Zendesk has "set the standard" when it comes to community work. "Zendesk has meaningfully involved their employees directly in making meals and in assisting people," he says. "And in humanising the experience that many individuals and families have living in the Tenderloin, which is challenging. "I wish Zendesk didn't stand apart as much as they do." When not doing community work Mr Svane continues to lead Zendesk's expansion. Despite the company's success, he says he doesn't consider himself to be a "traditional entrepreneur". Instead he says he simply enjoys working with computers. "I've always been working with computers, and I'm fascinated by what you can build and produce and what technology can enable you to do," he says. Born in Copenhagen, Mr Svane got into computer programming from the age of 11. After gaining a degree in economics, he went into the software industry in his 20s, and co-founded Zendesk when he was in his mid-30s, along with his friends Alexander Aghassipour and Morten Primdahl. Mr Svane says they saw a gap in the market for a simple-to-use system that enables firms to manage their interaction with customers, such as organising and responding to emails, or live internet help chats. After initially funding the business themselves, external investment soon followed, both before and after the move to the US. The company now has more than 600 staff worldwide, with offices in Copenhagen, London and Melbourne, and Mr Svane says he is focusing his efforts on securing more large customers. "We are still in the very early days of this company," he says. "This is the most amazing thing I've done in my life and I can't imagine doing anything else."